Wise Company provides dependable, simple and affordable food options for out of kitchen situations. With a wide variety of options for families and individuals interested in storing long-term foods in case of emergency, on a camping or road trip, or at the lease, you may never miss the kitchen at all. There is an assortment of great-tasting gourmet entrees, vegetables and fruits you and your family will love to eat. 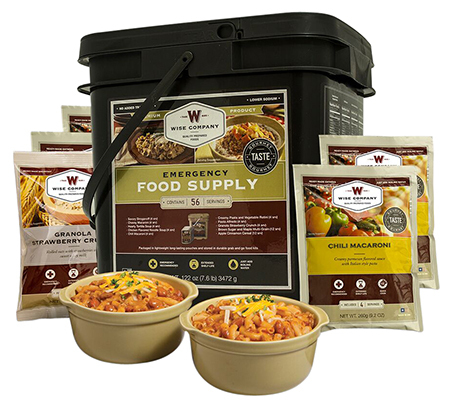 These ready-made, freeze-dried and dehydrated meals are nitrogen-packed in mylar pouches to maintain freshness and are prepared in minutes simply by adding boiling water.This is an emergency kit that is designed to get you started with your preparedness needs. These recipes have less sodium and trans fat. The 56 serving package comes with: four (4) servings of Creamy Pasta and Vegetable Rotini, four (4) servings of Chili Macaroni, four (4) servings of Savory Stroganoff, four (4) servings of Chicken Flavored Noodle Soup, four (4) Cheesy Macaroni, four (4) servings of Pasta Alfredo, four (4) servings of Hearty Tortilla Soup, four (4) servings of Granola Strawberry Crunch, twelve (12) servings of Brown Sugar and Maple Multi-Grain Cereal, and twelve (12) servings of Apple Cinnamon Cereal.